When using one in a home aquarium, the UV unit should be placed last in the filtration line. You want to first filter the aquarium water through your mechanical filter and then run the water through the UV device before returning the water to your fish tank. By first removing the solids in the aquarium water with your mechanical filter (canister filter, etc), you are helping your UV unit to attain maximum operational efficiency. The effectiveness of any UV sterilizer is determined by the UV bulb wattage, the age of the UV bulb,how clean the quartz sleeve is and the flow rate of the unit. UV Light Bulb The effectiveness of the bulb will deminish with time and use. Manufacturers usually recommend replacing the bulb after 6 months. You can find units with bulbs anywhere from 8 watts up to as high as 130 watts. The higher the wattage of the light,generally the more effective it is. If you have a unit with a lower wattage then you will want to have a lower flow rate to get the most out of the unit. UV Flow Rate The flow rate of the unit is an important consideration. Flow rate is measured in gallons per hour (gph) or liters per hour (lph). While higher flow rates may be acceptable for killing algae and some bacteria, you will usually need a much slower flow rate to kill parasites. For example, a 15 watt bulb will usually kill algae and bacteria with a 120 gph flow, but you will need to lower the flow rate to around 75 gph for it to effectively kill parasites. Read the manufacturers recommendations for your particular unit for effective bulb wattage and flow rates. Keep the Quartz Sleeve Clean One thing that some hobbyists forget about is the quartz sleeve that the UV bulb slips into. You must clean this quartz sleeve periodically to remove any build up in order to keep your sterilizer operating at peak efficiency. The better sterilizer units have a wiper with a handle outside the unit that allows you to quickly and easily clean the sleeve without taking the sterilizer apart. Do I really need an Ultra Violet Sterilizer for my aquarium? For indoor freshwater fish tanks that are well filtered and properly maintained, you really don t need one. Saltwater hobbyists may have a good excuse for getting one because of the high price tags for many of the saltwater species. However, most hobbyists really don t need one if they are doing things properly. Doing things properly would mean using a quarantine fish tank for new arrivals and performing frequent fish tank maintenance. Outdoor pond keepers may want to invest in a UV sterilizer to help control algae problems in their out door ponds. 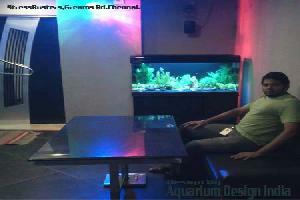 Keywords : Aquarium Accessories, Aquarium Ultraviolet Sterilizer slaes in chennai,UV filter buy in chennai.